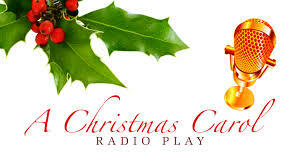 Vince Carney Community Theatre and Hickory Grove Convention Center announce a 2016 Holiday Dinner Theatre presentation of "A Christmas Carol: A 1930's Radio Play," an adaptation of the classic Dickens story of Scrooge and the three spirits who teach him the importance of love and friendship. The play is based on the original transcript of the live radio production which aired on December 24, 1939. Tickets for this show are $40 per person, and include a 5-Course Holiday Dinner through Hickory Grove Convention Center. Dinner will be served before the show, and a dessert bar will be offered during intermission. This is an ideal venue for any company holiday party! Full tables of 8 may be purchased for celebrating the holidays as a group! Tickets go on sale on November 14, and must be purchased online. NO TICKETS WILL BE SOLD AT THE DOOR. For more information, please email vcctrochelle@gmail.com.